It's Monday, normally a day to return to the grind. But for many of you, today is a day off because of Presidents’ Day, which makes this the perfect start to the week. It’s also the perfect time to look for perfect cards. It's what we call Mint Monday. Presidents’ Day is the day we here in the USA celebrate the birthdays of our first President, George Washington, and our 16th President, Abraham Lincoln. 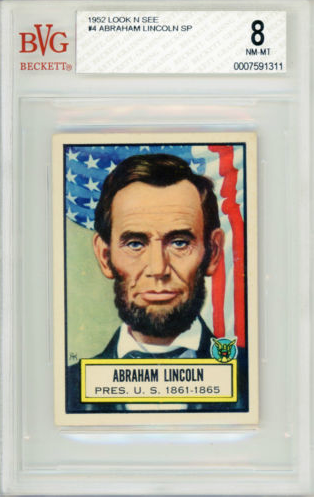 So finding some Minty cards of Washington and Lincoln just makes sense. 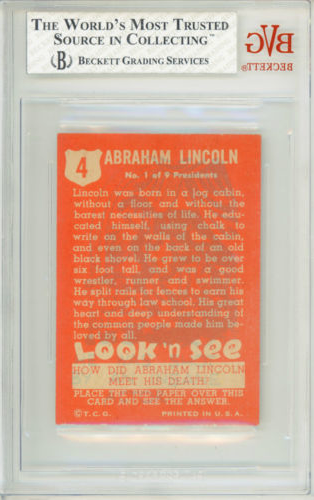 There have been quite a few releases with the US Presidents, but we decided to go with an iconic set, 1952 Topps Look ’N See Trading cards. 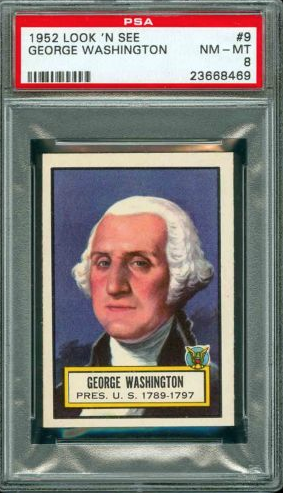 The set consists of 135 cards, each measuring 2-1/16” x 2-7/8” instead of the modern standard of 2-1/2" by 3-1/2". 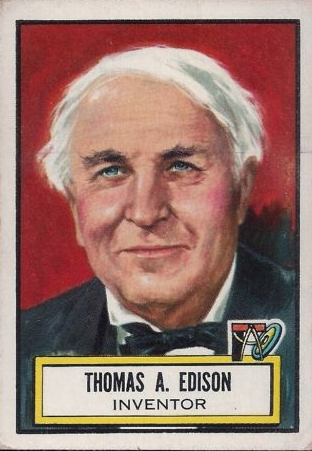 As with many sets back then, it was released in multiple series, just like the iconic 1952 Topps Baseball cards. 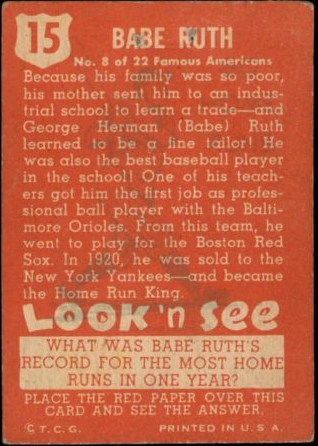 Look ’N See was released in two series, 75 cards of the first and 60 cards for the second. Each card back had a trivia question. 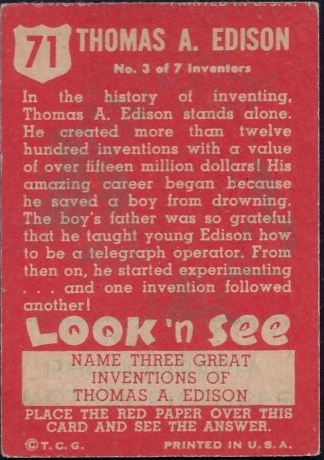 A red piece of cellophane could be held over the card to reveal hidden answers. The set was full of famous personalities. 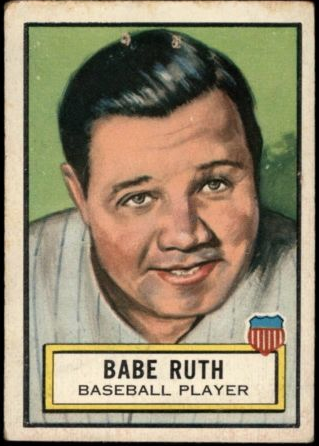 Babe Ruth was the only athlete in the set. 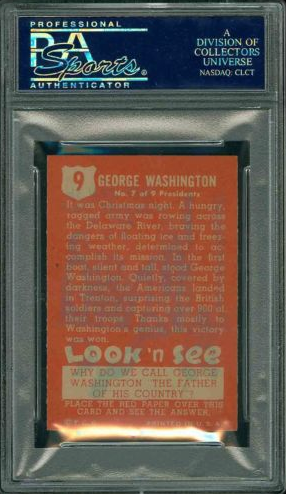 There were a lot of centering and chipping issues with these cards so finding high grade Look ‘n See cards is not easy. Our Mint Monday cards are certainly towards the top of the scale. This card has no qualifiers and looks to be in great shape. The biggest issue appears to be centering. And if we are going to give you Washington, we have to give you Lincoln. Centering seems to be much better on this card and the back looks clean. That will do it for this Mint Monday. Enjoy the day off if you have it, and for everyone, hopefully this is the start of a perfect week.